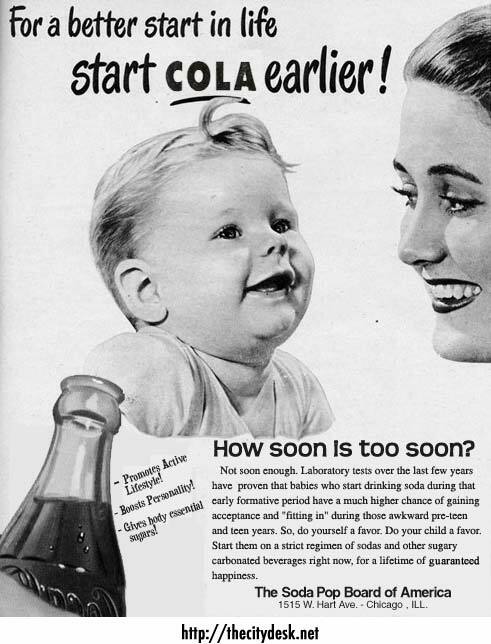 Many, many years ago, I made this fake ad exhorting parents to give soda to their babies. It was done on a bored afternoon when J.D. Ryznar asked for someone to make that very specific thing on his livejournal in 2002. I whipped it together, posted it to the web, joke over. THEN. A couple of years later- it started showing up online, in those weird lists that pop up every so often with a “Oh man, ads sure were strange back then, weren’t they?” theme. Thing is, those ads are largely real and mine is not and very obviously so. It has made people angry about evil corporations wanting to put chemicals in your kids’ bodies. It has been in text books. It has even been on Ellen as a real old ad (and latter edited out once I emailed them). I’ve seen people selling it on posters and fake old-timey tin signs. Just so you know. It is very fake. There was never a Soda Pop Board of America. There was never an organization advocating for soda for babies. But, it gets forwarded and forwarded and forwarded again. This thing will outlive me by several decades. Pingback: Blog My Future » Blog Archive » Vintage soda ads: Can you spot the fake? Ah, a modern version of H. L. Mencken’s great “Bathtub Hoax.” It’s good to know that some people will take anything seriously, no matter how absurd.